When you think chocolate mousse, you think of copious amounts of chocolate, sugar, eggs and butter whipped together to create a luscious, fluffy and airy dessert. My mum used to make Julia Child’s Mousse au Chocolat when we had guests over. She would serve it topped with a dollop of homemade whipped cream and some orange confit. It was so good, she would win raves. I remember it got to a point where people would actually ask her (more like beg her) to make it when she invited them over for dinner. I loved her mousse au chocolat, and I still do. To me, mum's mousse au chocolat means home, family and friends. It’s a special dish, but let’s be honest, it’s a calorie bomb. There’s point no denying that. Sugar and butter and eggs and chocolate, all natural ingredients, yes, but a lot of them, too much of them. Once in awhile it’s OK to have it - on special occasions such as birthdays, Christmas; but that’s about it. 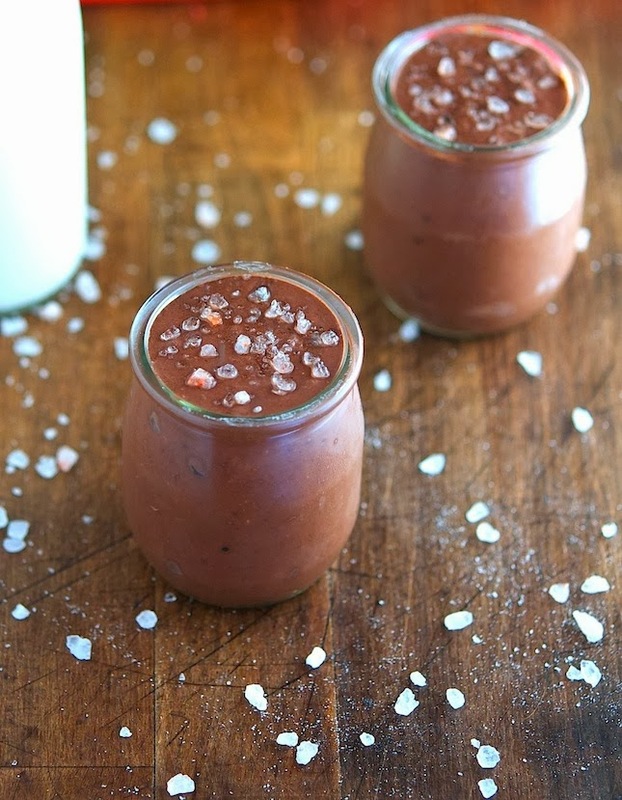 That’s when this chia chocolate mousse comes into play. This is a great little recipe that has become a chocolate fix favorite in my apt. It’s arguably one of the easiest recipes on the planet; no cooking, no whipping, no creaming. All you need is a 4 ingredients and a blender. That simple. And you know what’s even more awesome about it? 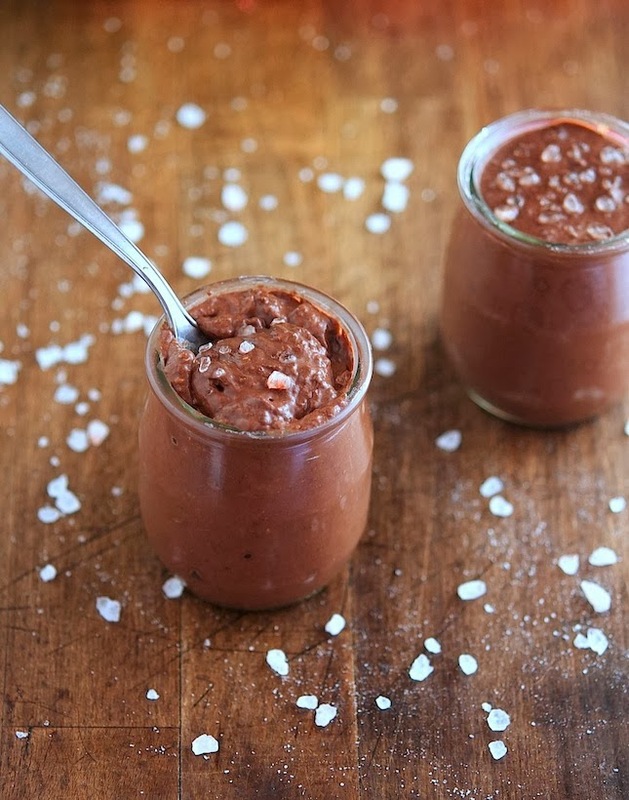 That this chia chocolate mousse accommodates everybody, I mean E-V-E-R-Y-B-O-D-Y! Rawists, paleoistas, vegans, vegetarians, omnivores, etc, you name it. Everyone is allowed to dig into this delicious dessert. And between the chia seeds, cocoa, banana and coconut milk it’s a true nutritional powerhouse. However, what really matters to me is that this chocolate mousse is good, REALLY FREAKING GOOD! Chia Chocolate Mousse Print this recipe! Note. I don’t really feel there’s the need to add coconut sugar, but my GF strongly disagrees with me; so I’ll let you be the judge of that. It really comes down to how sweet you like your chocolate mousse to be. * If you can’t find ground chia seeds, you can grind them in a small coffee grinder. Combine all ingredients in a blender (or food processor) and process until creamy and smooth. Place chocolate mousse in a bowl or single serving bowls/ramekins and put in the fridge for at least 30 minutes to allow ground chia seeds to solidify. If you’re like me and believe that chocolate and salt are a marriage made in heaven, sprinkle with a pinch of sea salt before serving. One serving (without coconut sugar) yields 205 calories, 16 grams of fat, 16.3 grams of carbs and 4.5 grams of protein. I need this, in my life, NOW! I'm addicted to chocolate mousse - this could be the healthy solution for me - thanks! It is the solution Tibs! your blog is really informative and inspiring. This looks absolutely delicious! I just discovered chia seeds, will try it out soon. Same story here, real Mousse au chocolat is reserved to Christmas. Wow, I will defiantly book mark this recipe! 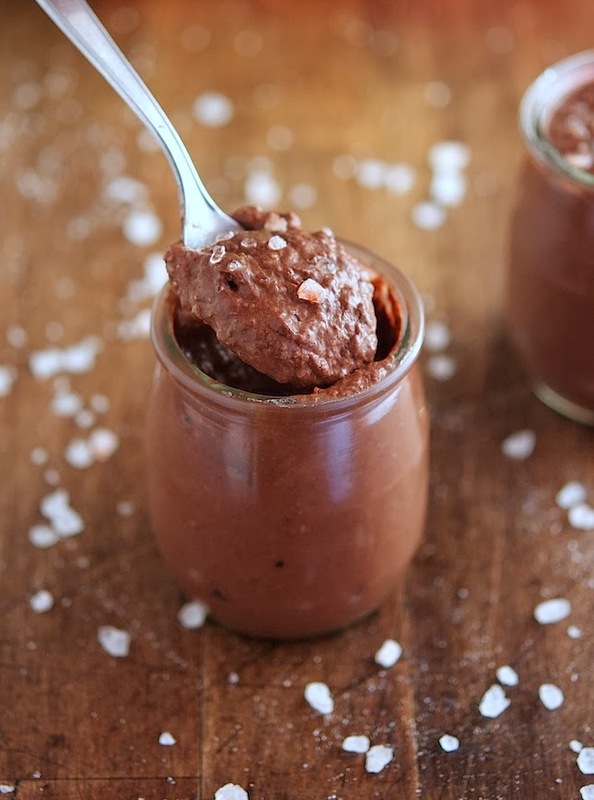 I love these chocolate pots and the salty touch, oh so yum. There's nothing quite like chocolate and salt, at least for me! Wow man. I've been staring at these photos for the past like... 10 minutes. I can't seem to detach my eyes from this mouthwatering dessert. I'm right with you on the coconut sugar not being necessary thing, though. I like my chocolate DAAAARK, really dark! In fact, I think that a whole banana might even be too much for me. I would probably use an avocado instead, and add a tablespoon or two of date paste. Oh yes! That chocolate mousse? It gives me neeeeeeeds! It's a deal then! Nut butter for chocolate mousse. Boom! love it - been looking for guilt free desserts - and such easy chocolatey ones are winners! yum! You are so right, 363 days without chocolate mousse wouldn't be a life worth living... i used to do something similar to this, but since i'm not really in to the banana flavor (it takes over way too much in my opinion!) I played around a bit and came up with my favorite.... the secrets? Avocado and silktofu. You're awesome Fanny! I'm so gonna try this recipe (maybe swapping the silktofu with a banana? ), thanks for sharing. Yum! I would like one of those right now! Im in love with chia, this looks so good! Oh my goodness, this looks SO delicious!! I love that you added some salt, I feel like chocolate and salt go so well together. I love this. So simple, exactly as food should be! You can sub the banana with one avocado (although the cocoa tend to hide all other flavors, it still tastes a bit of banana). As to the chia seeds, you can definitely use them whole, but it will be less smooth. First of all, I have to say you have a perfect blog for me! Everything what I believe in & Im passionate about, love it!! Oh, and the recipes.... wonderful! I run a lot, but Im not strong on cooking healthy food, even though I really try. My weak side is chocolate or everything connected with it...so this recipe for the chocolate mousse I very appreciated. I`ll try it out this week for sure! Thanks Maja, let me know how you like it! Absolutely not Maria. Actually, it makes me very happy that you liked it! Looks delicious! I reckon I could eat a whole bucket full of this chocolate mousse. Holy cheezits! This is ggggoooooodddd! I made this tonight ... and ... I'm in love. I'm trying not to think too much about how good it is because my fiances portion is in the fridge and I'm sorely tempted to take some of his! Haha! It was superb! Quick and easy dessert. I tried this a few days ago, and I replaced coconut sugar with honey, and the taste is just amazing! My only issue was that it was a bit more liquid that I expected it to be, even though it sat in the fridge for quite some time.. Should I add more cocoa or banana next time you think? Curious if you think honey or maple syrup would be ok substitutes for the coconut sugar? Additionally, would almond milk work well instead of coconut milk?